Here are some observations on the 2014 elections from politicians, professors, journalists and others. “I don’t think anything’s here to stay forever. People respond to what works.” Senate Finance Committee Chair Mike Mazzei, on GOP dominance. A couple of state House GOP members could be in trouble. With a victory by Gov. 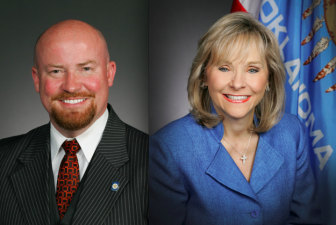 Mary Fallin and GOP dominance of the legislature, Fallin will likely attempt to “right-size” government in her second term. “Voters are actually likely to have a tax cut in the next four years.” CapitolBeatOK Editor Pat McGuigan. McGuigan: At the same time, a closer look at questionable tax incentives and credits could occur. “A reelected governor with no coattails has very little leverage to get things done.” University of Oklahoma political science Professor Keith Gaddie. On guns on college campuses: “They’ll keep pounding on this until they win. That’s what I’m afraid of.” John Wood, University of Central Oklahoma professor. Women are small percentage of the legislature, but two now represent adjacent districts in Cleveland Co.: Claudia Griffith joins Emily Virgin, both Dems. Election officials are gearing up to remove tens of thousands of Oklahomans who haven’t voted in years from the state’s voter rolls – a controversial practice voting-rights advocates say can lead to disenfranchised voters.